While in port in Genoa, take a private sightseeing shore excursion to explore this beautiful Italian city. Known as ‘La Superba,’ Genoa is the birthplace of Christopher Columbus and one of the most important maritime cities in Italy. On your full-day private tour, take a stroll along the UNESCO World Heritage-listed Strade Nuove, admire the magnificent Basilica of San Lorenzo, discover the old fishing village of Boccadasse and more. When your cruise ship docks in the Genoa port, your driver will take you on a full-day, private shore excursion. 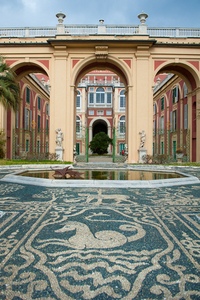 Travel by luxury car around this maritime metropolitan city and visit some of the best Genoa attractions independently. See the Torre della Lanterna, the main lighthouse for the city's port and an important aid to the area’s nighttime navigation. Explore the Aquarium of Genoa and discover the sea life exhibitions, the hummingbird sanctuary and more. For lunch, ask your driver to recommend a typical trattoria and indulge in an authentic Italian meal. Then, take a stroll along the historic Strade Nuove, a UNESCO World Heritage Site, and see the prestigious buildings lining this street. Immerse yourself in the noble history of Genoa as you wander past 16th-century villas and a labyrinth of tiny medieval alleys calledcaruggi. Visit the Basilica of San Lorenzo independently and see the remains of the old city walls near the magnificent church. In the 12th century, the ashes of St John the Baptist, the patron saint of Genoa, were buried here. Your private driver will then chauffeur you to the Boccadasse area of Genoa, an old fishing village with stupendous views. Visit a lovely church dedicated to St Anthony from the 18th century and take a stroll along the elegant Lido d’Albara. Finish your day with a taste of refreshing gelato (own expense). After a day full of sightseeing, your driver will bring you back to your ship in the Genoa port.